thanks, will surely try it. Funny though, i went on your blog to ask for the recipe of yemenite soup, and found a recipe for lox! anyway, the recipe I tried sucked, so do you mind sharing? Shabbat shalom! Place bones and water in a 6-quart pot and bring to boil. Skim residue from top and discard. Add remaining ingredients. Simmer 2 1/2 hours. Now for the changes. I use a bigger pot so I use about 3 pounds of meat and more water. The meat could be anything, althouth I end using lamb most often. I still use 3 carrots, but more potatoes. Also, I use a 28oz can of crushed tomatoes with basil. I leave out the celery, and use indian curry (3 tablespoons) and ground cumin (1/4 teaspoon *2). I also add twice the amount of salt than in the original recipe. Once the meat and the water boil, I add the vegetables, crushed tomatoes, spices, salt and sliced parsley on top. I then bring it to boil again and then simmer it on a small flame for 2 1/2 hours. Some amounts depend on the size of the pot, so you will see how much to use. I hope that it comes out to your liking. Let me know how it comes out. thank you for the prompt reply! I will definitely keep you posted. btw, what is FB? I don't buy lox so no idea. The taste also depends on the spices you use. 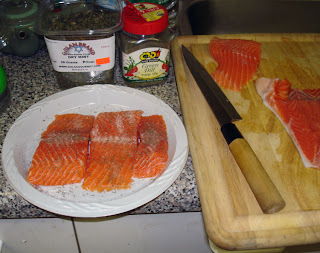 Also, to make to make it resemble commercial lox, use at least a 2lb weight. awesome salmon lox recipe! came out really good and fast. The soup was also very good, but needs a bit of tweaking here and there to make it "ours." Thanks a lot! We eat that soup for like half a week. We use the 3.99/lb meat from Glatt Mart. Made your soup again (was looking for lox recipe and decided to give this soup a try). This time I made it in crockpot and it was delicious! Don't know what exactly was just right last time, maybe the lack of crock pot, but this time it was awesome! Thank you!!! Weird, never made it in a crockpot.